It was then that nine beautiful souls were slaughtered during Bible study at the Emmanuel African Methodist Episcopal Church. This requires our highest prayers to the Most High, El Elyon, and our asking for assistance in healing the schisms that exist within the hearts and minds of humanity. was no rage, no accusations, simply a profound witness to the power of God’s Love. Afterward, people outside the courtroom gathered and sang gospel hymns. They handled the tragedy with such love and a sense of community. 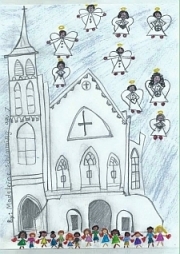 Sadly, as events like this shooting happen all too frequently, we realize that we are in a most critical time in planetary history and it is keenly important for us to do the higher work – of cultivating Peace in our Hearts and in our Minds, and visualizing the Dove of Peace over all areas of conflict, especially now in Charleston, SC. KODOISH KODOISH KODOISH ADONAI ‘TSEBAYOTH.